Gold Leaf Studios was founded by William Adair in 1982. 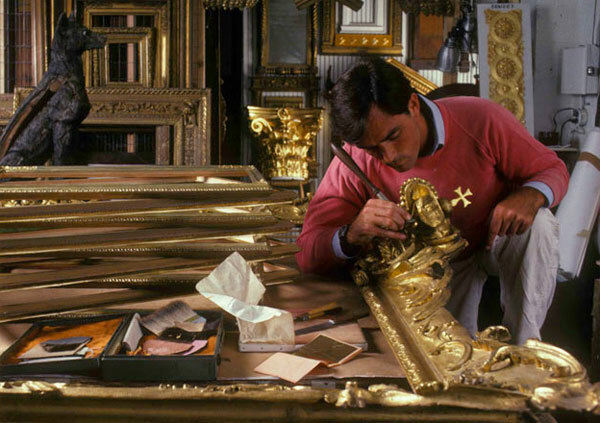 We are an internationally recognized authority on frame fabrication, conservation, gilding, and large-scale architectural gilding. We provide comprehensive framing services including hand-carved reproduction frames of period styles as well as custom-designed modern frames. Additionally, with our collection of over 3,000 antique frames we offer clients extensive options in choosing an original period frame. We maintain museum standards of conservation, mounting, and matting to protect and enhance artworks. Our clients include private collectors, museums, galleries, historic homes, universities, government agencies, and architectural and interior design firms.